Receive appointment requests via your cell phone. Easily confirm appointments and inform patients when you are on your way. THE PriveMD APP LETS YOU GET NEW APPOINTMENT LEADS AT THE TAP OF BUTTON. YOU CAN NOW UTILIZE YOUR FREE HOURS TO VISIT YOUR PATIENTS DIRECT AT THEIR HOME. How to setup a medical visit? Enter you location on the map. Request an appointment and set a day and time for visit. Find a medical professional on the MAP or LIST view. Review the medical professional that fits your needs and budget and click BOOK. You may contact your medical professional either by phone or text using the PriveMD app. You may cancel a medical visit at no charge prior to the medical professional driving to your location. After that point, there is a cancellation charge. If you have special instructions for your medical professional such as where to park, gate codes or other tips, please enter them in the section prior to booking. Finding the right medical professional for you. Review medical professional education, expertise, cost and review. We have a medical professional that is right for every budget. You may call a medical professional for someone else (i.e. parent, child, friend). Please enter this information when ordering the visit. You may enter a credit card upon registration or prior to completing the medical professional booking process. Do I need to pay the medical professional? Medical Professionals are not allowed to accept any payment other than via the PriveMD App. Upon completion of the visit, your credit card will be charged the pre-approved price and you will receive a email statement. You may enable, disable or change your credit card at any time via the app. In which cities is the PriveMD app available? PriveMD are always adding new territories. If we are not in your area yet, we will be soon. What services does the PriveMD app provide? 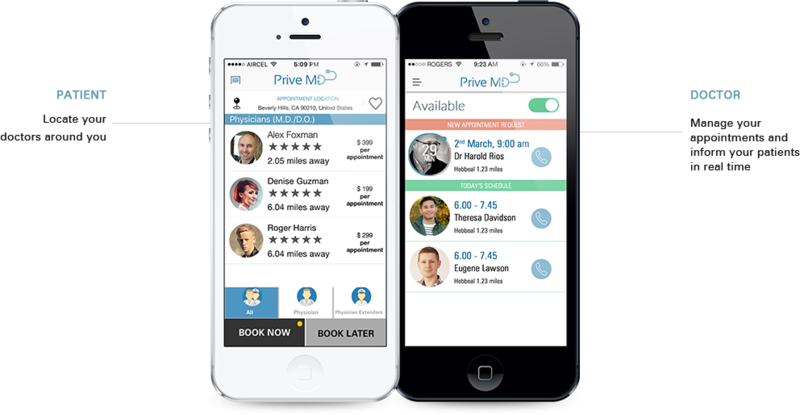 The PriveMD app provides most medical services (physicians and physician extenders) you would receive at a primary care or family practice medical office. Please check the PriveMD info for a description of services provided.